How do they know it's Christmas in Ipswich? I also remember have a frightfully engaging conversation with the woman at the supermarket about how many strangled prostitutes had been found in Ipswich. It was all gripping stuff. And easy to make jokes and have silly conversations about something that was taking place in far away Ipswich. So I was intrigued to see London Road, best described as a play with music, that attempts to recount and make some sense about the serial murders and the community that lived through it. The red light district, seamen, police tape and neighbourhood watch meetings are all set to music in a sung-spoken kind of way. It has captured the immagination of the National Theatre-going public and is now running through to August. 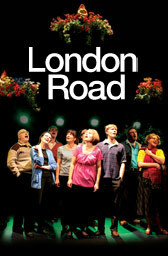 The first half of this play works very well and focusses on the residents of London Road. While the media described the street as the local red light district, the reality was not quite like that. Prostitution gradually escalated after being pushed out of other areas. As prostitution starts to become ever-present, women start to disappear. It is the shades of grey that this production brings out about the story and the community is where this works best. There are the meetings over cups of tea, the banter between neighbours, the hysteria and the siege mentality that develops as every week another woman disappears and another body is found. One of the best lines is by a resident who said something along the lines of: "The police were telling people all sorts of things except for the obvious which was don't be a prostitute and don't get into a strangers car at night". The second half of the show turns out to be less successful. After intermission London Road resident, Steve Wright, is caught. The piece then seems to get bogged down in the processes that follow and the media attention rather than how the community is coping with the matter. There is a loss of any sense of irony and a persistence of the alienating music that sounds more like an orchestra tuning up. It starts to wear a little thin and you begin to yearn for a song that could better capture the emotions and feelings of the people depicted. Amongst all this is a rather unpleasant message that emerges that the community were somewhat grateful for the serial killer cleaning up the street and bringing them together. It has to be the first show since Serial Mom to make you wish you had your own mass murderer on your street. It then proceeds with a trite message of how hanging baskets and a cup of tea solved all evils. While I would never doubt the power of builders tea and geraniums to heal some wounds, in the end you are left feeling the production is as shallow as the media coverage it purports to critique. Upon leaving the theatre the actors take up a collection for a charity that supports prostitutes in Ipswich. Since they are shafted in this show you feel like the least you can do is hand them your spare change. Hopefully the piece is a work in progress and it will be interesting to see how it develops. At the moment it is more an interesting study than an entirely satisfying evening.